Is the seventh Mario Kart game the best one yet? Hoo, boy, that's quite a question. My knee-jerk reaction is to say no, it isn't, but the only predecessor that can compete with and possibly surpass it--in my opinion, obviously--is Mario Kart Wii. (Note: I've played and enjoyed every Mario Kart game in existence except Double Dash!!) As such, I'm thinking I should compare and contrast the innovations each of these titles brings to the series in order to come to a conclusion as to which one earns top billing on this blog. 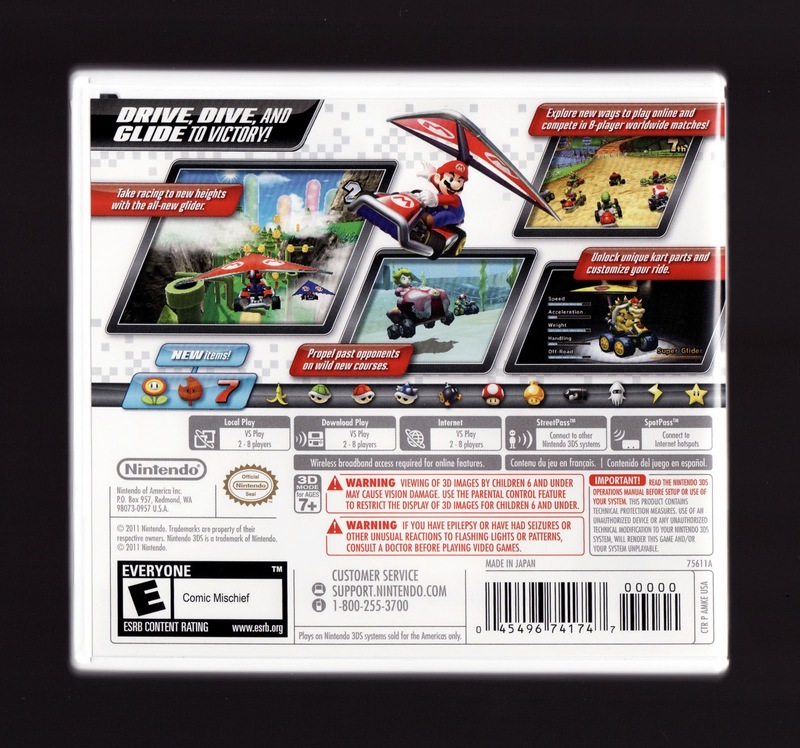 Starting with Mario Kart Wii: It has more items (19 vs. 18, three of which are new), more racers (24 vs. 16) and more vehicles with which to race--including motorbikes, which I thought were kind of cool. It also allows for "waggle" control, which is especially fun if you use the steering-wheel accessory, and online races of up to 12 players. 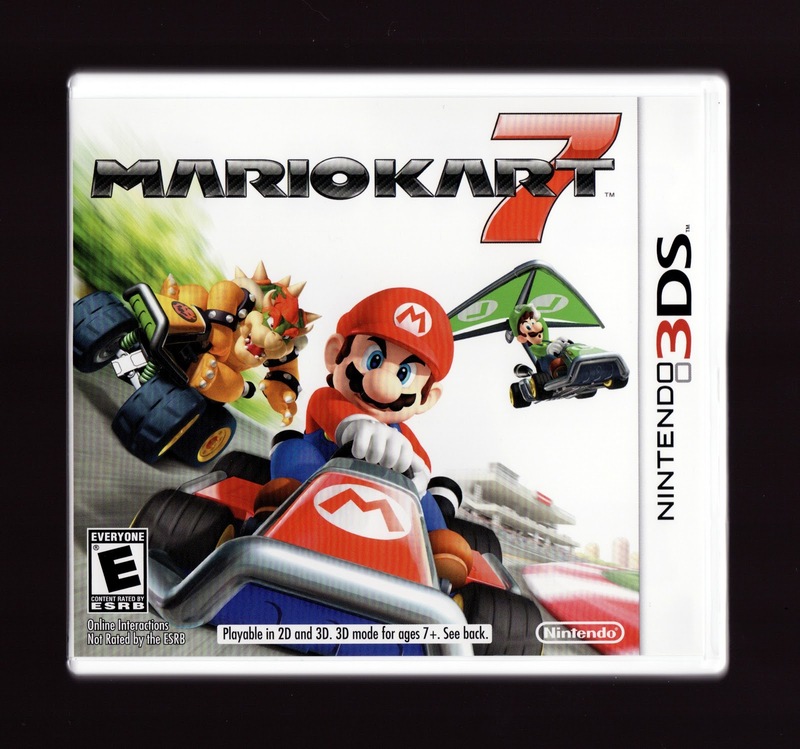 Mario Kart 7, on the other hand, adds coins (last seen in Mario Kart: Super Circuit) back into the mix, allows players to customize their karts in a multitude of ways, introduces gliders that aid airborne vehicles, includes SpotPass and StreetPass functionality and offers up an alternate control scheme that enables players to steer by tilting their 3DS systems. Both games feature the same number of tracks (32, 16 of which are new and 16 of which are pulled from previous entries) and similar-enough gameplay, graphics, music and modes. Given all of that, I'm ... not any closer to being able to choose a "winner" than I was at the beginning of this write-up. If possible, I'd suggest getting them both, as I consider both of them to be top-of-the-heap Mario Kart games. (Don't worry, that's a good thing.) If you can only choose one, though, I'd probably go for the Wii iteration, as I find it a bit easier to control and I prefer its course and kart selection. You didn't like Double Dash? I always felt it was a great mario kart that gets unfair criticism. I've only played a bit of mario kart 3DS but loved what I did play of it and found the 3D effect to really suit it. I didn't say that I don't like Double Dash! !, Retr0gamer; I said that I've yet to play it! I actually only the darn thing, I just haven't popped it into my GC or Wii yet. Soon, I promise! You need to play Double Dash! !, Bryan! It's my favorite of all the Mario Karts. I think it's the most balanced, the most fun, and being able to race with two favorite racers is better than one! I spent only about half an hour with the Gamecube version of Mario Kart, despite adoring the GBA version and DS version. I borrowed Mario Kart Wii and played it one evening, but it didn't click with me. Meanwhile I accidently clocked 30+ hours on the 3DS game, which is now my favourite of all the Mario Kart games. However, I see your point about holding an item. Holding L on the 3DS is a little more uncomfortable than some other systems. Justin: Yeah, I know I've got to pay it. And soon! I don't have anything against it, really I don't, it's just that I rarely play my GC games these days (even though you can fairly easily do so on the Wii). Who knows, maybe when I finally get around to playing and mini-reviewing it (I can't call these Great Gaymathon posts 'real' reviews because they're just too short and superficial) I'll end up saying that Double Dash!! is the best of them all. Speaking of which one is best: What are your feelings on Mario Kart 7 at this point? Also, how does it compare to the Wii version in your mind? Hey there, dock! Huh, well, I'm sorry MKWii didn't click with you. Why was that, do you think? Did you not like the new courses, the controls, etc? I think it's pretty interesting to hear people's opinions of the different Mario Kart games. Some people swear the SNES original is the best, some say the N64 version is the best, some pledge their allegiance to the DS version. For some weird reason(s), I seem to like the Wii one best, although I like each of the aforementioned iterations quite a bit, too. Well, with the exception of the N64 one, which has never set well with me. Actually, I'm not a huge fan of the DS version, either. Controlling that version is just a bit awkward for me--awkward enough that I never played it that much, anyway. OK, now I'm rambling. Thanks for your comment, and I'm glad to hear that you're enjoying Mario Kart 7! Oh, and as for your comment about holding items in MK7: Yes, holding the L button while trying to hold up the system and control my kart is not easy for me. Oh, well, it's not the end of the world! Ah, that's good to hear. Yeah, MK7 doesn't enrage me quite as much as MKWii, although it enrages me enough. Still, I can't help but love it. Perhaps its the 3D novelty which makes me feel engaged with MK7, but with the Wii version I felt like I was just going through the motions. BTW, have you ever tried out the arcade version of Mario Kart, the one with Tamagochi and Pacman? I wonder why that has never been ported. Hey there, Darwin! What don't you like about the Wii version, if you don't mind me asking? I really think the Mario Kart series can be summed up with "different strokes for different folks," by the way. Like I said in an earlier comment, there's really no consensus as to which of the series' entries are the best. Personally, I like the Wii version the best--or at least I do at this moment. I like the character selection (Toadette for the win! ), the bikes, the new courses, using the Wii wheel. I also loved the online racing. That said, I can fully understand why others don't love it as much as I do. I also love the SNES original, BTW. I think if I had to rank them at this point, I'd put MK Wii at #1, MK7 at #2 and the original MK at #3. I'm not much of a fan of MK64 and Super Circuit, to tell you the truth. Which Mario Kart is your favorite, by the way? As for the arcade Mario Karts: Nope, never tried 'em! I've never even seen them in the wild, to tell you the truth. Of course, I can't remember the last time I was in an arcade (sad, I know), so that probably has something to do with it. It sounds as though you've played at least one of them? If so, what are your thoughts? They feel fairly different from the home versions, don't they? The original SNES is my favorite, but I played a lot of multi with that one, so I know my impressions are a bit skewed. Haven't played much of MK64. The Wii version felt a bit empty to me, but I did only play single player. I should get the bf to go a few laps with me to see if my mind changes. The arcade game is a lot of fun, but I'm sure if you put any Mario Kart in a 4 seat arcade machine, it would be good too (except the Wii version, jk). I remember the graphics were really good, and it took a pic of you which displayed in-game. I hear ya about playing loads of multi in regards to the SNES original, Darwin. I have so many fond memories of battling my brother as a kid. If my husband played games, I'd force him to battle me all the time. Alas, that isn't the case. Also, I understand what you're saying when you describe the Wii version as a bit "empty." I don't quite agree with that assessment, but I understand it. It's actually one of the few problems I have with the more modern Mario Karts, by the way -- the stages are so big (and wide!) that things seem slower to me than they did in, say, the SNES original. I can see that making things seem more empty, too. As such, I kind of wish the series' designers would go back to making tracks that are a bit ... tighter, I guess is the word I'm looking for. I also dislike their use of "jumps" that take you from one part of a course to another, BTW. It kind of takes me out of the race.